Hazardous waste is waste that is dangerous and/or potentially harmful to our health or the environment. Hazardous wastes can be discarded commercial products, like cleaning fluids or pesticides, or the by-products of manufacturing processes. - Municipal solid waste (MSW), commonly known as trash or garbage (US), refuse or rubbish (UK) is a waste type consisting of everyday items we consume and discard. It predominantly includes food wastes, yard wastes, containers and product packaging, and other miscellaneous inorganic wastes from residential, commercial, institutional, and industrial sources. Examples of inorganic wastes are appliances, newspapers, clothing, food scrapes, boxes, disposable tableware, office and classroom paper, furniture, wood pallets, rubber tires, and cafeteria wastes. Municipal solid waste does not include industrial wastes, agricultural wastes, and sewage sludge. The Nonhazardous Solid Waste Management Regulations require that the collection and temporary storage of solid wastes at businesses, office buildings, multi-family residential complexes, restaurants, hotels and other similar commercial facilities be properly maintained to prevent environmental, public health and public nuisance problems. All solid waste should be stored in such a manner that will not cause or create fire, safety, or health hazards or provide food or harborage for animals and vectors (mosquitoes, rats, etc). All solid waste should be stored in such a manner that will not cause or create fire, safety, or health hazards or provide food or harborage for animals and vectors (mosquitoes, rats, etc). 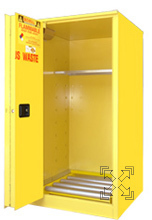 It is the responsibility of the occupant of a residence or the owner or manager of an establishment to utilize a waste storage system that will include containers of adequate size and strength, and in sufficient numbers, to contain all solid waste that the residence or other establishment generates in the period of time between collections. The owner or, if leased, the leasee of the storage containers shall be responsible for compliance with this requirement. Solid wastes shall be collected and transported to a disposal facility at a frequency adequate to prevent propagation and attraction of vectors and the creation of a public health nuisance, especially putrescible wastes. Putrescible wastes are those materials that break down quickly in such a manner that causes odors and attracts disease carrying vectors. W1040 - Self-Latch Standard 2-Door; Shelves 1; Dimension 65"H x 31"W x 31"D; Approx. Ship. Wt. 382 Lbs; Holds 1-55 Gal Drum + 1-5 Gal Safety Can. W2040 - Self-Close, Self-Latch Sliding; Shelves 1; Dimension 65"H x 34"W x 34"D; Approx. Ship. Wt. 387 Lbs; Holds 1-55 Gal Drum + 1-5 Gal Safety Can. 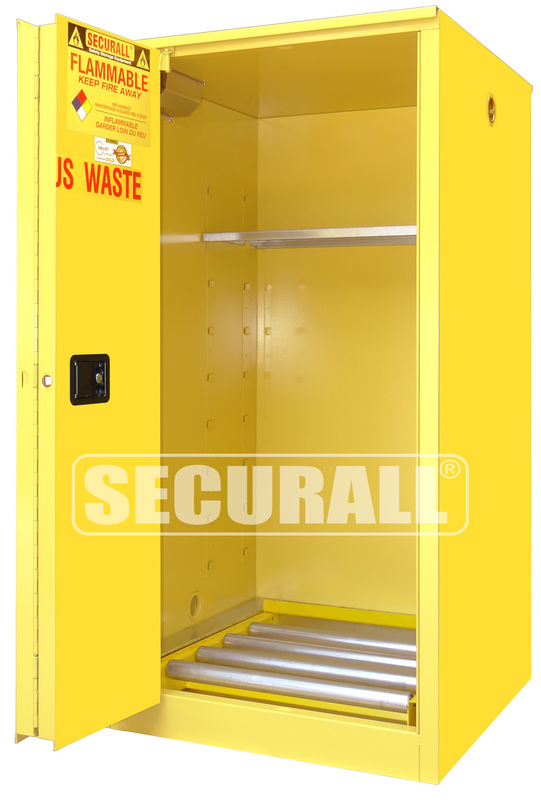 W3040 - Self-Close, Self-Latch Safety-T-Door; Shelves 1; Dimension 67"H x 31"W x 31"D; Approx. Ship. Wt. 404 Lbs; Holds 1-55 Gal Drum + 1-5 Gal Safety Can. W1075 - Self-Latch Standard 2-Door; Shelves 1; Dimension 65"H x 43"W x 31"D; Approx. Ship. Wt. 419 Lbs; Holds 2-30 Gal Drum + 3-5 Gal Safety Can. W2075 - Self-Close, Self-Latch Sliding; Shelves 1; Dimension 65"H x 43"W x 31"D; Approx. Ship. Wt. 424 Lbs; Holds 2-30 Gal Drum + 3-5 Gal Safety Can. W1080 - Self-Latch Standard 2-Door; Shelves 1; Dimension 65"H x 56"W x 31"D; Approx. Ship. Wt. 581 Lbs; Holds 2-55 Gal Drum + 2-5 Gal Safety Can. 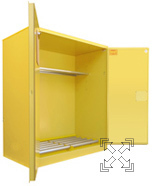 W3080 - Self-Close, Self-Latch Sliding; Shelves 1; Dimension 67"H x 56"W x 31"D; Approx. Ship. Wt. 610 Lbs; Holds 2-55 Gal Drum + 2-5 Gal Safety Can. W1045 - Self-Latch Standard 2-Door; Shelves 2; Dimension 65"H x 43"W x 18"D; Approx. Ship. Wt. 337 Lbs; Holds 9-5 Gal Safety Cans. W2045 - Self-Close, Self-Latch Sliding Door; Shelves 2; Dimension 65"H x 43"W x 18"D; Approx. Ship. Wt. 342 Lbs; Holds 9-5 Gal Safety Cans. 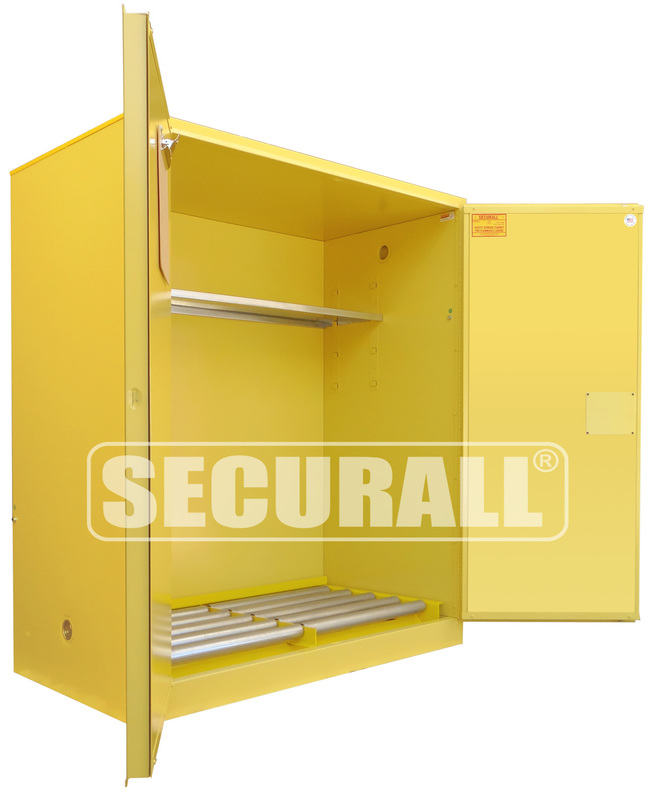 W3045 - Self-Close, Self-Latch Safety-T-Door; Shelves 2; Dimension 67"H x 43"W x 18"D; Approx. Ship. Wt. 357 Lbs; Holds 9-5 Gal Safety Cans. W1060 - Self-Latch Standard 2-Door; Shelves 2; Dimension 65"H x 31"W x 31"D; Approx. Ship. Wt. 372 Lbs; Holds 12-5 Gal Safety Cans. W3060 - Self-Close, Self-Latch Sliding Door; Shelves 2; Dimension 67"H x 31"W x 31"D; Approx. Ship. Wt. 394 Lbs; Holds 12-5 Gal Safety Cans.